That comma usage and placement is correct. 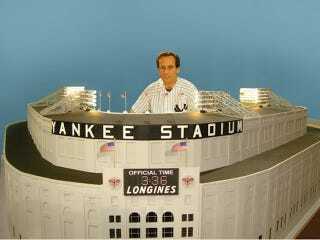 According to Hammacher Schlemmer, this "1/8-scale replica of the 1961 Yankee Stadium, meticulously researched, hand-built, and hand-painted by artist Steve Wolf, whose stadium models are on display in the Los Angeles Sports Museum" required 3,000 man hours to complete. The 100-pound monster costs almost as much as season tickets in the best sections of the real Yankee Stadium. Or, as reader Robert noted, the model of the House That Ruth Built costs just about as much as real house that Ruth could build in his hometown neighborhood of Pigtown, Baltimore. If he weren't dead and actually wanted to live in Baltimore, of course.